Well this is it everyone, the video you’ve been waiting for over a year to see. 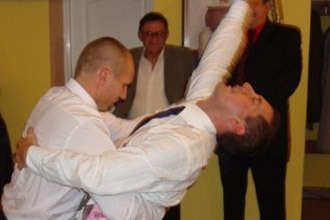 The Polish Wedding Dancing Competition. Which I was able to win due to irrational behavior caused by chronic alcohol intoxication from drinking a few liters of potato juice, wodka. (In Polish the word Vodka is spelt and pronounced wodka, and comes from the word water, woda!). This also coincides with the first time I met Dorota’s family. Being the newest edition to the family and being a foreigner almost the entire family wanted to have a toast with me, and in stereotypical Polish tradition with a large shot glass of vodka. Now perhaps, that, I could may have survived. But as already explained by Dorota in her post about the Polish wedding, several songs play where you have to down vodka to the music. So after each 20 minutes dancing interval, there is a song “A teraz idzieny na jednego” (translation: time to drink vodka), and you have another 20 minutes (or more) drinking (and eating) interval. There are also other songs (yes, there is a lot of singing) which everyone is singing together, followed by a shot of vodka. You will sing “Sto lat”, wishing them to live for long, followed by a shot of vodka, and “Gorzko”, which means bitter, so they have to kiss each other to make their life sweeter, obviously followed by a shot of vodka. Anyway I actually really don’t like dancing, especially in public in front of your girlfriends family you’ve met for the first time at their cousins’ wedding. However after several dozen shots of vodka nothing would stop me from dancing, in fact I was so good, I won the night’s dancing competition, whilst wearing a pinny and impersonating a lady. I’m so not looking forward to the next Polish wedding in 2011. Drink, dance, drink, sounds like a good combination. I never drive drunk or dance sober. Hello Alex, I love reading your blog and have added it to my new blog directory, I hope you don´t mind! I was doing research for my wedding blog and found your video and I loved it. I find wedding traditions facinating.